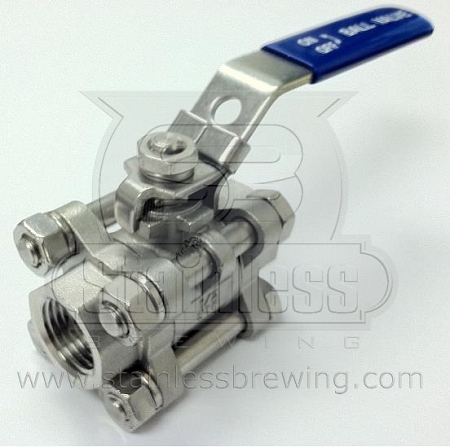 One of the major advantages of this three-piece ball valve is it's ease of cleaning. Simply remove the bolts to take the valve apart and soak the pieces in your cleaning solution, reassemble and reattach. easy to take a part and put back together. Best price i have seen. Very good quality. These are great valves, easy to take apart for cleaning. And this is hands down the best price i have ever seen on them. High quality, easy to clean and best of all, great price. I purchased 7 of these and haven't had an issue with any of them. Highly recommend. this sturdy 316 stainless valve will last a lifetime; easy to disassemble, great when I want to feel that "definitely clean" feeling. Ordered these ball valves and extra fittings to finish my CIP system as I was getting really tired of swapping hoses. All the fittings came in just as expected and all top notch! Totally satisfied!